(Beyond Pesticides, June 24, 2014) Research from the University of California, Davis CHARGE (Childhood Autism Risks from Genetics and the Environment) study finds that pregnant women who lived within a mile of agricultural fields treated with insecticides are more likely to have their child develop autism. The results of the CHARGE study, published in Environmental Health Perspectives, strengthens calls from public health and environmental groups urging regulators take a precautionary approach to agricultural chemicals and institute increased protections for those who live, work, or go to school near pesticide-treated fields. The CHARGE study looked at pregnant women’s addresses to determine their location relative to fields treated with pesticides. For women who lived less than one mile from crops sprayed with organophosphate insecticides during their pregnancy, researchers found the likelihood of their child being diagnosed with autism increased 60%. Women in the second trimester living near fields treated with chlorpyrifos, a widely used organophosphate insecticide banned for household use in 2001, are 3.3 times more likely to have their children diagnosed with autism. In response to a legal petition, the U.S. Environmental Protection Agency (EPA) in 2012 instituted risk mitigation measures for chlorpyrifos, including reduced application rates and no-spray buffer zones around sensitive sites, such as where children play. Although EPA is continuing to study how drift from chlorpyrifos treated fields impact those that live nearby, Beyond Pesticides and health advocates urge a complete ban on the use of this chemical. Chlorpyrifos is often referred to as the “poster child” for why EPA’s risk assessment, the current method for evaluating pesticides, does not work to protect the public, workers and the environment, given that safer methods, including organic practices and products are increasingly available in the marketplace. The UC Davis team also found links to the application of another class of insecticides not previously studied for associations with autism: synthetic pyrethroids. Living near a field where pyrethroids were applied during a woman’s third trimester corresponded with an 87% increased risk of having a child with autism. Synthetic pyrethroids, often touted as safer alternatives to organophosphates, or “as safe as chrysanthemum flowers” by pest control companies, are allowed for use in and around homes, in addition to their application on crop fields. But recent studies are showing significant concerns with this class of chemicals; linking them to learning problems, and adverse behavioral and emotional development in children. Despite new data on concerning health affects to children, in 2012 EPA expanded the allowed uses of these pesticides, and removed the protective safety factor for children. Autism is on the rise in the United States. According to the U.S. Centers for Disease Control, one in 68 U.S. children has been identified with an autism spectrum disorder. In 1981 this number was one in 10,000. Since only 2002, autism rates have increased 123% (from 1 in 150 children) in America. Although many attribute the increase to changes in the criteria for an autism diagnosis, and genetics have been shown to play a major role, a growing number of health advocates are concerned about how exposure to industrial chemicals relates to the rise in autism spectrum diagnoses. “It’s time to start looking for the environmental culprits responsible for the remarkable increase in the rate of autism in California,” said Irva Hertz-Picciotto, an epidemiology professor at University of California, Davis, in response to a 2009 study linking autism to environmental exposures. A Swedish study earlier this year found that genetic risk for autism accounted for only 50% of overall risk, leaving an interplay of environmental factors to account for the rest. Scientists are sounding the alarm on environmental chemicals linked to a long list of neurodevelopmental disabilities in children, ranging from autism, ADD, dyslexia and other cognitive impairments. “We need to know if some moms are at higher risk than others and what that risk is. Knowing who is most vulnerable is key to understanding how to better protect them,” said Janie Shelton, PhD, the CHARGE study’s lead author. Across the country, localities where residents live near pesticide treated fields are taking precautionary action to prevent the harmful effects of exposure. In Kauai County, Hawaii, the county council passed a measure that would implement pesticide buffer zones around crop fields where these chemicals are sprayed. However, agrichemical companies have sued the small island in attempts to stop the implementation of the law. 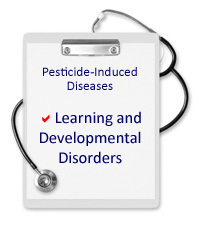 For more information, visit Beyond Pesticides’ Pesticide-Induced Diseases Database, where we track the science on how pesticides are contributing to the rise of learning and developmental disorders in children. This entry was posted on Tuesday, June 24th, 2014 at 12:30 am	and is filed under ADHD, Agriculture, Autism, Birth defects, California, Chemicals, Children/Schools, Chlorpyrifos, Developmental Disorders, Disease/Health Effects, Hawaii, Learning Disabilities, organophosphate, State/Local. You can follow any responses to this entry through the RSS 2.0 feed. You can skip to the end and leave a response. Pinging is currently not allowed.